We arrived in Phnom Penh to an overwhelming sight of crowds and noise. The former king of Cambodia, Norodom Sihanouk died on 15 October 2012 in Beijing. His body has been brought back to the royal palace to lay in state. A mourning period was declared by the government. Thousands of people lined the streets to pay their respects. It looked like every Cambodian who was able to make the trip to Phnom Penh was here.There were fireworks and the smell of incense hung in the air. Food and drink vendors took over every corner near the palace selling snacks of fried insects and snakes. I was so busy taking all of this in, that I did not manage to get a video to show you so I’m going to link a YouTube video taken by someone else so that you can see just how large the crowds were. 1. People have been much friendlier than in Sihanoukville or Kep. Every child that walks past us wants say hello to us, even if “Hello” is the only English word they know. More of the street vendors smile and make small jokes. 2. Beggars are out in full force along the riverfront and it hurts my heart just as much as it did in Bangkok because I don’t know what to do to actually help. It’s impossible to sit at an outside table at a restaurant without someone sending over a small child to beg. People say that you should not to give them money because that will encourage their parents to continue putting them out on the streets. What am I supposed to do when a small child is sent to my table to look at me with desperate eyes? There is no easy answer. I will always give food if asked. 3. The ugly sexpat tourist is easy to see here and they make me sick. I was determined to try more street food here than I had in Sihanoukville. I was disappointed by the results. Night market in Phnom Penh. There was zero chance of me trying any of the insects or snakes from street vendors as it looked like sales were slow and the same snakes were put out for several days and were starting to look a lot worse for wear. There were lots of meat on a stick snacks and while Micheal loves this, I do not eat much meat. I did try Durian ice cream which was good and had a very mild flavour compared to the fruit. The vendor found this so amusing that she kept giving me free tastes of the durian ice cream while laughing and even when I ordered another flavour, she made sure to put a small scoop of Durian in there as well. 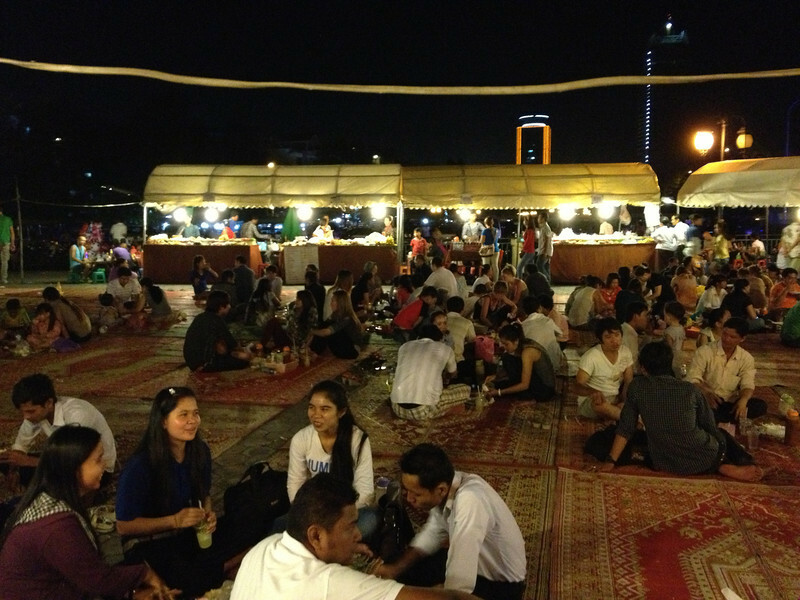 We went to the night market in order to try a wider variety of local food. We both piled a big plate full of anything that looked unfamiliar or interesting and sat down on a large carpet. Neither of us had any favourites and overall, a lot of the food we tried was greasy. Even the summer rolls were coated with a slick of oil. The food at the night market is not as cheap as you would expect since the market is aimed more at tourists and there is definitely a dual pricing scheme going on. I had some of the best curry I’ve ever eaten at one of the restaurants along the riverfront. There was also a naan bread stuffed with Cheddar cheese that was obviously catering to expat tastes but it was absolutely delicious. We tried a few local cafes and I never had a decent cup of coffee but I am really picky about my coffee. The hygiene was rather suspect at some of the places. I tried ordering a quick baguette sandwich ((also called nom pang) at one place and when I bit into my sandwich, a large roach jumped out and ran for his life. Suddenly, I wasn’t very hungry anymore. Look, when you are travelling for long period of time, sometimes you just want something familiar that you know is not going to upset your stomach. I’m not judging you because we were happy to see a Pizza Company along the riverside in Phnom Penh. We had tried this pizza and pasta restaurant in Bangkok and it is easily some of the best pizza I have eaten outside of the United States. Of course we were going to eat there. The clientele appeared to be mostly Chinese and wealthy Cambodians. There is a Dairy Queen next to the Pizza Company, which made Micheal happy because he developed a taste for blizzards while we were in Bangkok. Did we try enough Cambodian Cuisine on this trip? Not really, we still haven’t tried Amok. We have tried a lot of different noodle dishes. It’s impossible to try everything in the short time we had in Phnom Penh.